Poririua Mayor Nick Leggett: He’s Young. He’s Ambitious. He’s Wrong About The Flyover. Porirua Mayor Nick Leggett is young and ambitious. Rumour has it that, if Regional Council chair Fran Wilde gets her wish to be the boss of a Wellington super-city, Nick is eager to be her Deputy. So, since Fran is a flyover fan from way back, it’s perhaps no surprise that Nick Leggett decided to make a public show of support for a Basin Reserve flyover at a recent Wellington Region Transport Committee meeting. He issued a press release about what he called a “slap down” of Wellington City Council’s decision – charming choice of words, Nick! – painting himself as a hero riding to the flyover’s rescue. Unfortunately, he got a little over-excited in his statement, as a subsequent Wellington Scoop article pointed out in emphatic fashion. The Save the Basin campaign understands that decisions made about transport in Wellington City affect residents throughout the region. But before Porirua Mayor Nick Leggett made his bold claim to have “slapped down” the Wellington City Council’s decision to withdraw support from the proposed flyover and investigate alternatives, perhaps he should have done a bit of basic research on such matters as which way traffic on the flyover is meant to flow and where the proposed flyover will be positioned. The action by some members of the Wellington Regional Transport Committee appears to be an attempt to isolate Mayor Wade-Brown and the WCC, who are representing the majority of residents who have repeatedly rejected the proposed flyover. The Wellington Regional Transport Committee process lacks integrity. By introducing an unannounced motion and attempting to interfere in the decisions of another council – just two weeks before that council will release its findings on alternatives to the flyover – flyover supporters on the Committee have shown their increasing desperation. Of course, regional mayors like Nick Leggett and Upper Hutt’s Wayne Guppy are entitled to their own opinions. But, next time, they should think before they speak. Whisper Who Dares: Is The NZTA The Government’s Enemy Within? Many transport experts have weighed in on the short-sightedness, excessive cost and general all-around stupidity of the Government’s $10-billion-and-counting Roads of National Significance motorway-building programme. Now it’s time to meet the latest body to weigh in on the evils of the RONS – a disgruntled bunch called the New Zealand Transport Agency! At a hearing in Queenstown over a plan to replace the current one-lane bridge over the Kawerau River with a two-lane bridge, the NZTA said that the Government’s Roads of National Significance programme is preventing it from upgrading important infrastructure in the regions as soon as it would like. Senion project manager Phil Dowsett is quoted by Radio New Zealand as saying that the Roads of National Significance programme has pushed projects like this one to the bottom of the funding list. There has been plenty of criticism from the regions of the way the RONS has sucked money out of local road maintenance – and if Phil Dowsett was a lone voice within NZTA, it would be easy to write him off as a maverick, or maybe just unusually forthright. But from what we’re hearing, he is far from a lone voice. In reaction to our recent criticism of NZTA – criticism we think is richly justified by the agency’s public actions and statements – we’ve heard that, behind the scenes, a number of NZTA staff members are all too aware of the deficiencies of the Basin Reserve flyover project, but feel constrained by their position from saying so. Sometimes, in these situations, word has a way of getting out. If you hear something of interest, please email us at stoptheflyover@gmail.com, or come up and talk to us at forthcoming public events. This is the op ed by Save the Basin spokesperson Alana Bowman which appeared in Tuesday Dominion Post. There may be some slight variations between this version and the version published by the DomPost. When building a structure, the property owner instructs the builder. Not the other way around. When the New Zealand Transport Agency demands to build a flyover in the heart of Wellington it forgets its role. As a government agency that builds roads, it provides advice but residents who live there, the owners, provide the instructions. The builder certainly should not threaten the owner, as NZTA did in its December letter to the Wellington City Council warning that the funding for the whole regional transport plan could be pulled away because Council wanted to look at alternatives to a flyover at the Basin Reserve. The Save the Basin Campaign reflects those views. We are neither led by, nor a front for, any political party. The campaign includes members of various political parties, and many who are not members of any party, and every political party in New Zealand will have members opposing it. What unites us is not politics, but opposition to this outrageous flyover proposal. We appeal to the government to instruct NZTA to reflect the majority view, as it did with the War Memorial Park, and require a design without a flyover. A smart, efficient solution to transport problems is needed for the region and Wellington. Eastern residents and airport traffic want less congestion through the Basin Reserve, travelers throughout the city want more frequent and less costly public transport, and people appreciating the Wellington skyline want to retain that open view. Other large cities have solved these issues without flyovers. Why is NZTA unable to do so? A flyover would block views along Cambridge and Kent Terrace, creating a barren, cold space underneath to invite graffiti and danger from opportunists lying in wait. Three storeys tall, it would dominate the area from the War Memorial Park to Mt Victoria tunnel. The tacked-on pedestrian/cycleway would exceed NZTA’s promised maximum 12m width. The proposed flyover’s height would project increased noise and add grit to wind-born pollution throughout the area. The trajectory of travel required from the Mt Victoria tunnel to meet up with the War Memorial trench will create a roller-coaster ride. Built just 20m from the gate of the Basin Reserve cricket ground, one of Wellington’s places of pride, and level with the R A Vance Stand, its noise, vibration, and dust would forever destroy the unique atmosphere of this historic and world famous cricket ground. The trustees of the Basin Reserve face a difficult, and probably painful, choice. If they don’t oppose the flyover, they may persuade NZTA to “mitigate” the degradation of its environment with a modern grandstand and player facilities; but by opposing it they lose an opportunity to improve the grounds with no cost to either the Trust or the city. The problem lies with the flawed design of any flyover. Cheers rang out when San Francisco’s Embarcadero elevated freeway – one long flyover at its waterfront – was torn down in 1991. Now Auckland plans to remove one of its more offensive flyovers, at Hobson Street, because it is a “blight to the area, obscures views to the waterfront and is a barrier to pedestrians.” Other cities around the world have done the same – Toronto, Seoul, Boston, Milwaukee, Vancouver, Trenton, Portland and Chattanooga. The government’s current development of the War Memorial Park, of which we can all be proud and enjoy, should be supported by a traffic option which extends its parkway to include the Basin Reserve, not an ugly, towering motorway flyover. The anger expressed by many editorial letter writers and submitters reflects the frustration that something should be done, and quickly. The Save the Basin Campaign urges NZTA to abandon its stubborn insistence on an outdated, impractical flyover. With a more forward-thinking, urban-friendly alternative, we can just get on with it to ensure that Wellington is better placed to accommodate future population growth and innovations in transport technologies, and enhance, not hinder, the progress of a modern capital city. Working in the NZTA must be like stepping back into public service prehistory. The tea lady brings the tea trolley round twice a day with a big pot of tea and a packet of Chocolate Wheatens. The boffins in the basement have just taken delivery of a very large crate containing the agency’s first-ever computer. It’s a hot day in the drafting office, and a particularly daring young man is wondering whether he could get away with ditching his long trousers and wearing walk shorts, long socks and sandals to work. OK, it’s probably not like that at all. It’s probably all iPads and change management consultants. But whatever the internal culture, NZTA’s transport thinking remains resolutely stuck in the 1950s and 1960s, when the solution to every problem was another flyover. Freeway removal, including flyover removal, now has its own Wikipedia page, with examples from round the world. 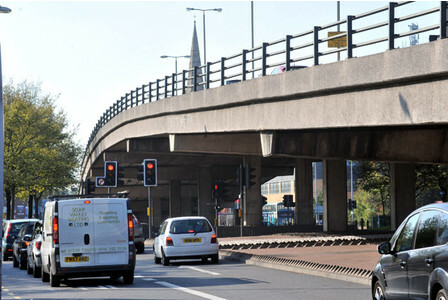 In Leicestershire, business interests are behind calls for the removal of a flyover that one civic leader described as an “unwanted colossus [that] needs removing as soon as possible”. Popular economics site Freakonomics looks at studies that show how demolishing freeways and flyovers can reduce congestion, while building flyovers and freeways increases congestion. But meanwhile, in the NZTA offices, the wall-mounted clock ticks down to leaving time at 5 p.m. sharp, the carbon paper is in triplicate, and transport thinking remains stuck in a wasteful, expensive and outmoded past.